First off, DGS koukai rokuon (public recording) in CharaHobby 2009 info. You can apply using all three of these methods, but it’s limited to one entry per person per method. Aside from the tshirt CCP, there will also be goods for HiroC, OnoD, and Kousei Suwa. They drew a lottery to see who would do what and HiroC drew “Kamiya Hiroshi no hatsukai no aji candy” (Kamiya Hiroshi’s first love-flavored candy), OnoD drew a keitai (cell phone) strap, and Kousei Suwa drew nabeshiki. Once again, HiroC’s bad luck at drawings comes through again, haha. The tshirts will be sold via mail order so those who can’t make it to CharaHobby won’t have to worry. And now, time for some reviews! I will review the new OP/ED single, My Dear Girl!, the latest chapter of DGS from SYLPH vol.7, and a little late but I will also review the first DGS CD, Dear Girl ~Stories~. The new OP/ED single includes 7 tracks including two songs and two karaoke tracks. The two songs are, of course, the new opening and ending theme for the radio show, My Dear Girl! and Tsuki no Mane. It took a while for me to get used to My Dear Girl! and I have to admit that I probably like Say Your Name! ~Dear Girl~Tsuki no Mane better. , however, I absolutely love. The lyrics, the melody, everything about it is great. The other tracks are Tyurya Tyurya Birthday, an off voice version of Tyurya Tyurya Birthday, and if Dear Girl ~Stories~ Hontou wa Konna Bangumi ni Shitakatta. Tyurya Tyurya Birthday was a remix of HiroC’s birthday. Lots of Ono Soutou, hehe. The off voice version just didn’t have the dialog from the show and only had HiroC and OnoD singing “tyurya tyurya.” if Dear Gear ~Stories~ was a non-crazy version of the show. You know, sort of like how the show was before the chaos that would become Duriangelion. Though it was nice hearing some of the old corners, it was rather… boring. Haha. They were doing weird stuff like ranking OnoD’s tshirt colors, etc. DGS really wouldn’t be the same if this is how the show was, and frankly, I don’t think they would reach 100 shows had it been like this, LoL. Overall, for a mere 1575 yen, this single is a really good deal. Vol.7 of SYLPH continues the story of SeiG trying to take over OnoD’s personality spot on the DGS radio show. It comes with a “Nice*Shita Jiishiki” (shitajiki/pencil board) and VitaminZ drama CD, and if you bought it at Animate, it also comes with DGS Hibiki and Kuranoa postcards. The shitajiki has a little game on the back. In this chapter of DGS Hibiki, we find out why SeiG is so determined to be on the DGS radio show. I laughed at some of the radio jokes that were included. There was one part where HiroC and OnoD were going out so they had to change and OnoD wore the Ono Soutou outfit and held in his hand a Gachapin costume saying, “This one’s yours.” For that he got hit on the arm, haha. I love how they incorporate stuff that happens on the radio show into the manga. Anyway, it turns out SeiG wanted to be on DGS to make his friend Misaki, who is in the hospital, happy. She is a big fan of DGS and SeiG had promised that he would get on DGS if Misaki’s letter were read on the show. While there was comedy in the chapter, I think this one appealed a little more to the emotions. Good chapter nonetheless and the magazine is worth buying if only for the shitajiki. It was explained that Iwasaki Saya sensei one day just decided to draw a color illustration of DGS Hibiki, so she asked the SYLPH editors to use it for something. Haha, Nice*Jiishiki! This review’s a bit late. 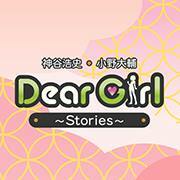 It’s the first CD released by DGS, simply titled Dear Girl ~Stories~. It includes the first OP and ED themes, Say Your Name ~Dear Girl~ and Kienai Omoi ~Dear Letter~. I’m a big fan of the original themes. Another song, DIRTY AGENT, is also on this CD. It’s a fun song that was recorded for a purpose that’s now been forgotten, haha. Other tracks include a remix of Duriangelion, OnoD’s mottekite (bring the SYLPH) songs, HiroC vs. Mecha OnoD and OnoD vs. Mecha HiroC, a couple Dear Letter tracks, and a freetalk at the end. Durian Trans Mix is funny and helps you relive Duriangelion. There’s a lot of HiroC screaming/whining, LoL. OnoD’s mottekite songs were re-recorded and the Vol.5 song was new. You can hear HiroC trying not to laugh. HiroC vs. Mecha OnoD and OnoD vs. Mecha HiroC are hilarious! HiroC and OnoD talk to their partner’s chaku voice (voice recordings for cell phones). They’re really funny. For the Dear Letter tracks, HiroC and OnoD wrote Dear Letters to each other. HiroC wanted to leave his at “I don’t have anything to say,” but the producer got mad at him and made him do a longer letter, haha. In the ending track, they talked about the CD and stuff. We learn that OnoD had to record the Vol.5 mottekite song twice because he gave up halfway through the first take, haha. This is an enjoyable CD, especially for fans of DGS. I highly recommend it. And thus concludes this round of reviews.